Building good social skills helps in all aspects of life. HOPE relies on community support to provide services to children with hearing loss. While we receive some funding through state and federal programs, this amounts to only 30% of our revenue. The other 70% comes from grants, fundraising, and individual donations. Private donations and corporate sponsorships are welcomed and all donations are greatly appreciated. HOPE School is a non-profit organization under section 501 (c)(3) of the IRS code. Contributions are tax-deductible to the full extent allowed by law. Tax ID # 20-1535497. Please feel free to contact Kim Schafer at kim@spokanehope.org or (509) 868-0044 with any questions or for additional information on donating. Sadly, on May 22, 2014, the families of local deaf and hard-of-hearing children, along with her “family” at HOPE School, had to say goodbye to Jan Johnston, one of the founders and supporters of HOPE School. At age 59, Jan passed away after a short but hard-fought battle with soft tissue sarcoma. Jan leaves behind a legacy of caring, teaching, advocating, mentoring, fighting like a bulldog, and loving that will continue to be in the hearts of the families she served and those who have the privilege of working with children with hearing loss. 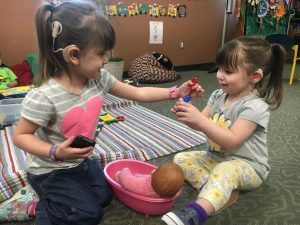 Spokane HOPE will strive to honor her vision and continue her mission to “optimize the acquisition of listening, learning and speaking skills in children who have hearing loss and to provide a supportive environment for their families”. Since Jan passed away, there has been an outpouring of interest from the community to honor her legacy and a desire to support her mission. The Janet Johnston Memorial Scholarship has been formed to help ensure that all children with hearing loss have an opportunity to attend HOPE, regardless of their family’s ability to pay tuition. Paypal is the easiest way to help support HOPE. Use the form below to make a donation to HOPE. Stop in at any Yoke’s Fresh Market and pick up a Community Card (or contact Kim Schafer as she has cards and can get you signed up). Use the card every time you shop to earn up to 5% for HOPE. If you are already an eScrip member, just sign in to your account to add your Community Card. You must present your Community Card each time you shop in order to earn donations for HOPE. eScrip contributions are not earned on purchases paid using a credit card. All payment methods other than credit card will earn contributions on qualifying purchases. Sign up for the Community Rewards program by linking your Fred Meyer Rewards Card to Spokane HOPE at www.fredmeyer.com/communityrewards. You can search for us by our name (Spokane HOPE or by our non-profit number 90431). Rewards cards are available at the Fred Meyer Customer Service desk. GoodSearch.com donates half its advertising revenue, about a penny per search, to HOPE if you use this link. This is a grew way to help support HOPE School without paying a cent out of your own pocket. GoodShop is operated by the same people behind GoodSearch. Simply use their site to find a link to an online store (thousands of options including Amazon, Apple, Best Buy, JC Penny, and more).